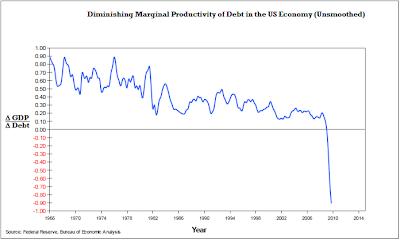 On March 20th, I posted the now famous Diminishing Marginal Productivity of Debt chart that I dubbed THE Most Important Chart of the CENTURY. This chart has literally been passed around the globe, published in major newspapers, and its significance debated on YouTube. Of interest to me is how the mainstream media won’t touch a chart like this, yet foreign press will. That fact alone should be disturbing. There were a lot of people who understood the premise of the chart and its implications and meaning in perspective to history. Then again it was obvious that it left others bewildered and looking for more answers. This article is an attempt to reach both upwards into the higher levels of thinking, and yet also an attempt to explain what’s happening on a more rudimentary level so that more people understand how this chart is made and what in the world it means. Let me begin by stating that the use of the term “Chart of the Century” in the title was very purposeful. It’s meaning, though, could be read several ways. Some people interpreted that to mean that I meant “of the 21st Century,” while others thought of the past 100 years. I mean both. And I stand by the claim that this chart, when fully understood, debunks modern economic theory; it is the result of the very misguided Federal Reserve Act that was passed into law in the year 1913, almost exactly one century ago. The outcome of what happens will be the greatest influence on what occurs in the 21st century. I do not believe this to be hyperbole. Those who have studied economics, monetary systems, and history know that the major events of history are almost always preceded by economic upheaval and usually by collapses in credit or in monetary systems themselves. To see this picture for yourself, simply look at what events preceded within one decade WWII, WWI, the Revolutionary War, the War of Independence, and then keep on going back in time looking in the decade prior to major events throughout history, all the way back to the fall of the Roman Empire. The events wind up in history books, but the underlying tensions, the root causes are often overlooked. Is it simply coincidence that there was a credit bubble of massive proportions in the “Roaring Twenties” that led to an economic collapse and Great Depression in the 30’s? And that that collapse was followed in the next decade by WWII? Why is that pattern repeated time and again? If you can dive deeply enough into this chart, you will discover the WHY and the WHO. The math doesn’t lie. 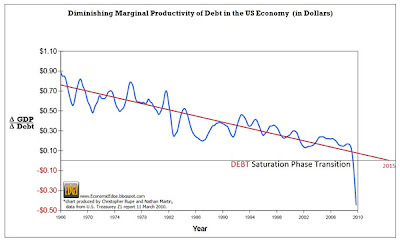 The math of debt-backed money doesn’t work, and the Diminishing Returns chart reflects this. In my previous article I said that the chart was a very simple one, and it is. Understanding the calculation and grasping the concept is obviously more difficult, so I invited Chris Rupe, who actually performs the calculation and builds the basic chart following the formula developed by Legg-Mason, to take a shot at explaining the calculations for those wanting a more in-depth understanding. Recently, I shared this graph with Nathan Martin and he has since made it famous. It has been showing up on dozens of other blogs (here, here, here, here, here, here, here, here for example) and there are continuing questions as to the source of the data as well as the methodology used to calculate it. 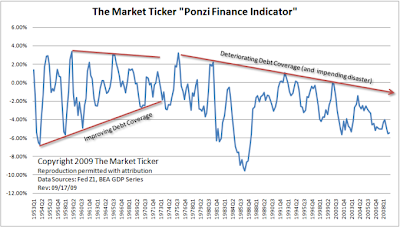 The data sources are the Federal Reserve Z.1 Report, specifically, the Total Credit Market Debt figure and the annualized quarterly Nominal GDP number from the Bureau of Economic Analysis. I was sort of the progenitor of resuscitating this graph according to the original Legg Mason format and methodology. Total Credit Market Debt includes all public debt (federal, state, local) and private debt (mortgages, auto loans, credit cards, etc.). It does NOT include the unfunded public liabilities such as Social Security, Medicare, etc. Since I have the dataset, and have been compiling and thinking about it for a year and a half, I feel compelled to give my opinion on what I think it means. The chart is not hard to reproduce, although a bit tedious. The specific methodology is simply a 4 quarter moving average of (GDP(t) – GDP(t-4))/(Debt(t)-Debt(t-4)), where ‘t’ is in reference to the quarter in question. The plunge goes to -0.91. So, that’s really all there is to the method, although there are a number of other ways you can calculate and plot a chart to get the gist of what is occurring here. Karl’s chart has some advantages over the other presentation. For example, I believe Karl’s chart uses a year over year % change format for his data rather than a year minus year format. Thus, his chart is not as susceptible to the problem of dividing by very small (close to zero) numbers that the other chart is. Indeed, if you go back in time far enough (I have this data back to 1916) this problem occurs more than once. Now, there has been some debate as to the significance of this chart. Some think it is not very significant since it is recognized that if either the numerator OR the denominator goes negative, then the chart goes negative. If both are negative, then the chart yields a positive number. Others think that correlation is not causation w/r/t the impact of debt on GDP. Obviously, some think it is very significant. Nathan Martin referred to it as the ‘Chart of the Century’. I agree with the detractors insofar as this is not a perfect metric of our predicament. GDP, for example, is kind of a fuzzy number. Not just because of tabulation games the government plays along with the constant revisions, but because GDP doesn’t even have a universal definition. Different countries calculate GDP in different ways. I flatly disagree that debt and GDP are not correlated. 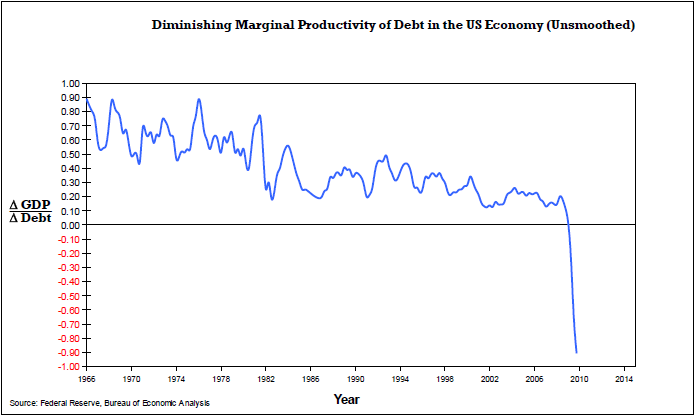 Indeed, I view this chart as a measure of the Marginal Velocity of Debt in the economy. I have referred to it as such before. In this view, Total Credit Market Debt is synonymous with the Total Money Supply. All money is debt, and this debt has value and has varying degrees of liquidity. To the extent that debt loses it’s value or becomes totally illiquid (Home Equity Loans anyone?) it ceases to be money. To the extent that debt is paid back or is defaulted on, money supply shrinks! This is an unconventional view of money. There would be howls of protest against this view ranging from mainstream (keynesian/monetarist) economists to the austrian economists. Gary North might disclaim me. However, I have never liked any of the monetary statistics as compiled and named, M0, M1, M2, MZM, etc. I find them too narrowly focused on the liability side of U.S. bank balance sheets. A lot of money is missing in that view. Much of it is obscured by multiplier effects due to the advent of off-balance sheet entities. Some is not counted. Cash held by foreign central banks for example. The way I see it, all loans must be originated by U.S. banks whether or not they are held on or off balance sheet. This is a distinctly asset side of bank balance sheet view of money. And ALL of this money is accounted for in the Federal Reserve Z.1 as Total Credit Market Debt. So, I have sometimes referred to this statistic as ‘Mtotal’. This velocity measure thus follows the familiar equation of exchange: Velocity = GDP/(Money Supply) and Marginal Velocity = Delta(GDP)/Delta(Money Supply). Not just correlated, but plain old related as can be seen. My own view overall is that the chart indicates (however imperfectly) that something significant has occurred. Indeed, nothing like it in 65 years. Anyone can check the Z.1 history and see that Total Credit Market Debt has never had a year over year decline in the postwar era. I view it as confirmatory (in our unique circumstances) that we have ‘hit The Wall’ with the amount of debt that the economy can carry (debt saturation). Politicians and policy makers have been able to keep the game going by continually and incrementally debauching lending standards. Think about it this way. A large reason why we have emerged from every postwar recession and renewed the credit cycle to grow to ever greater heights is because the policy response has been to allow, nay, promote the decay of lending standards. In the ’60s you had to have a 20% downpayment. PMI applied to tiny fraction of mortgage loans. Credit cards required either a security deposit or were secured by a savings account. The point is, they had some kind of collateral. After the early ’80s recession, Usury laws began to go away so credit cards eliminated their collateral requirements now that they could charge very high interest rates. 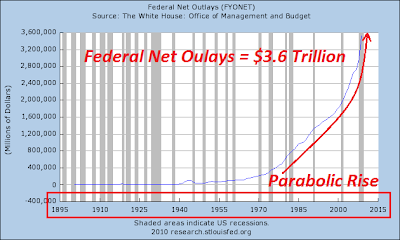 Also, the law was changed to take Social Security surpluses and use them to buy government debt. This effectively lowered the lending standards to the government since they now had a guaranteed buyer. Incidentally, this change plus the continued growth in credit set up a feedback loop to artificially lower rates on Treasury securities. After the ‘91 recession, reserve requirements on most bank accounts were eliminated and Adjustable Rate Mortgages began to really grow as a % of home loans. FICO scores were developed in lieu of having any actual collateral for loans. Credit cards were now given away freely to any college kid with no job. Banks begin to financially innovate ways to originate loans but package them into off-balance sheet trusts which are sold, not counting against their capital requirements. After the 2001 recession, the gloves come off and anyone can get a loan for anything, no downpayments, bad FICO score, no job. Sometimes the bank will even loan more than the asset is priced at. In this way, the policy makers took down the artificial barriers (read safety net) of prudence in lending because no politician wants to deal with a nasty recession or perhaps fewer campaign contributions from Wall Street. So, we eventually reached the point where there were simply no safety nets left and all that remained was ‘The Wall’. You just can’t stuff anymore credit into the system. We have crashed into the wall. For the rocket scientists in the audience who really want to understand the exact numbers and calculations, Chris started a thread on Ticker Forum where he walks people through the calculation and shows how the numbers become negative – Ticker Forum posts on Diminishing Returns Chart. What Chris is describing in his bullet points above is “how to build a massive credit bubble.” Look at the second chart, the unsmoothed version, and see just how bad the math was at the end of 2009. 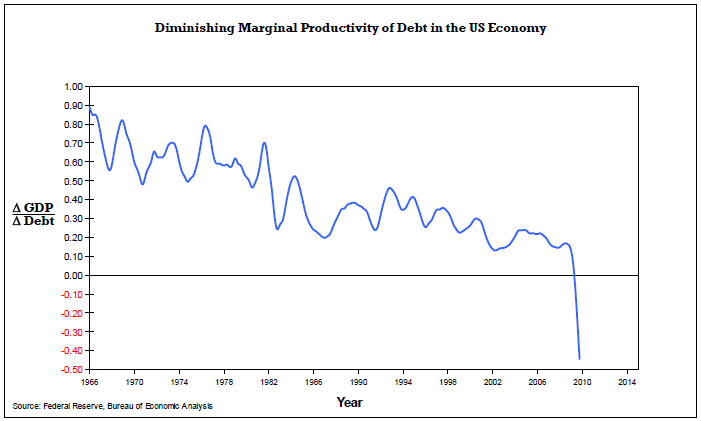 While you’re up there looking over those charts, note how ever since the post WWII era that the productivity of debt has been diminishing the entire time, producing lower high after lower high. This reflects the anchor of carrying ever increasing amounts of debt. The Federal Reserve Act of 1913 placed our nation, and then rapidly the world, into a debt-backed money box. Since that time the world’s productive efforts have been siphoned off in ever increasing amounts as the chains of debt-backed money began to bite harder and harder. The math of debt grew exponentially since that time. We transitioned from working with millions, to billions, and now trillions. No monetary system and economy has ever successfully made it to the next higher level. It’s literally impossible to because incomes have not grown at nearly the same rate. It requires income to service debt, and once you have pulled all your future earnings into today, it’s impossible to pull even more forward. That’s where we are today on the macroeconomic level. Income cannot service existing debt. Yes, the numbers have been negative before and they have snapped back to produce a lower high. This chart will most likely make a turn back upwards, however, it is very likely to make yet another lower high. How long can the cycles continue? Not too much longer, once in the parabolic growth phase, the crush of the math happens quickly. It is non-linear and thus events that seem to come quicker are actually occurring quicker, that is an expression of the exponential function as is the chart below. Crazy and before unheard of swings in the market? A symptom. Riots in Greece? A symptom. No more mail service on Saturdays? A symptom. Massive underemployment? A symptom. The central bankers at the IMF “rescuing” countries with debt? A root cause. The PRIVATELY owned and controlled central banks place everyone and every nation into a debt backed money box and an impossible math situation that drains the productive efforts from the societies placed into that box. To understand how that FACT is related to the diminishing returns chart, let’s examine three different rooms – A, B, and C.
In each room there are exactly 10 people: 1) A construction firm owner, 2) a hardware store owner, 3) a carpenter, 4) a restaurant owner, 5) a chef, 6) a school teacher, 7) clerk for the Hardware store, 8) a waitress for the restaurant, 9) a barber, and 10) a poodle – hey, dogs are people too and mine drives an entire economy all on his own! In Room A, we are going to create an environment where there is no debt – zero. Then we are going to introduce an eleventh person who enters the room and hires the construction firm to build a house for $15,000 (think 1950’s). Thus new money enters the room. In that very simple example, it is easy to see how increasing taxes decreases velocity. What if the first transaction was taxed at the rate of 100%? Then the velocity would be zero as no money would pass to the first set of hands. What if there were NO taxes? Then there would be no friction and the money would continue to circulate around the room. In Room B, we create an environment where the ten people in the room all possess an amount of debt to service that equals say 20% of their income. The eleventh person enters the room and hires the construction firm owner under the same terms. He passes $15,000 to the construction firm owner who, being 20% of his income in debt must immediately send $3,000 to the bank to service his prior existing debt. Thus $3,000 exits the room, leaving $12,000. He makes a deposit to the hardware store owner who also must send 20% of what he just took in to the bank, plus he must pay taxes. You can see where this is going… Duh, it’s only common sense, right? Of the money injected, the PRODUCTIVITY of the money is diminished, and by the time it filters down, there may not be enough left for the poor poodle who is likely going to go hungry. In Room C, we take it to the other extreme where everyone in the room owes 100% or more of their income in debt. The eleventh person enters the room and hires the construction firm owner who owes so much of his income to the bank that when handed the $15,000 he MUST use it to make a payment on his debt with the bank. 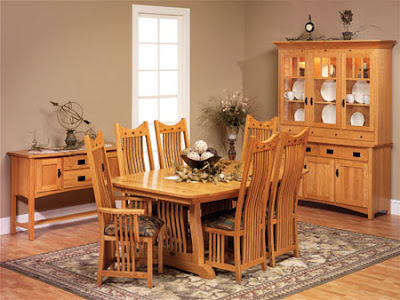 The $15,000 thus immediately leaves the room, no money makes it to the carpenter or anyone else, and everyone in the room subsequently goes hungry. It doesn’t matter how much money you pour into this room, debt will always outpace incomes. There is thus no economy. Money/ debt is created and it simply circles right back around to the bank. Obviously this is an extreme. But let’s say that the room reaches a point that’s in-between room B and room C, say 70% of income in the room is used to service debt. Then let’s say that the Construction firm owner takes out a big loan. If the size of his income fails to increase to service the increased debt load, then it places greater strain on the velocity of the new money that enters the room and it affects not only him, but everybody in the room. In fact, if he takes on too much unserviceable debt, he may have to lay workers off, especially if his income falls. 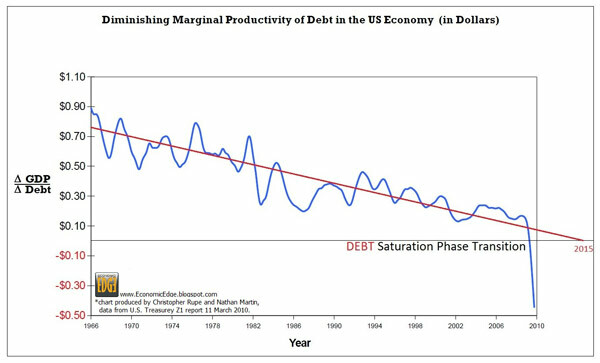 Macroeconomic debt saturation occurs well before it reaches 100% debt to income. Once you cross that fine line then adding more debt into the system results in insolvency and also in lower employment. This is why in the 1940s, the nation only 30 years past the Federal Reserve Act, was able to generate a recovery without the quantity of money exploding into an exponential growth phase. Here we are nearly a century past and we are living through an explosive exponential money growth phase. Remember, the Central Bankers created a system in which all money is backed by a liability. We’ll get back to that (why, who). 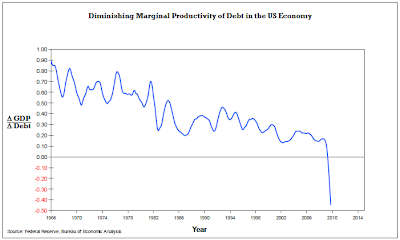 Okay, so now you get the picture, the Marginal Productivity of Debt is really a tale about the marginal velocity of debt. Debt is money. Economists don’t talk about the velocity of debt, they talk about the velocity of money. They have charts and formulas that work pretty well in room A and even in room B. But where they fail miserably is approaching room C – the room where debt saturation has occurred. This is because their way of thinking, whatever you call it – Keynesianism, neo-modern economics, deficit spending, stimulus, deficits don’t matter, must get credit flowing, solving a debt problem with debt, lunacy, insanity, whatever – is simply erroneous and does not work in a 100% debt-backed money system. Modern economist’s calculations for the velocity of money, for example, do not take into account the very mechanical action that is plain to see happening in the rooms above. They have failed to take out their basic calculators and add up all the debts to see what level of saturation has occurred throughout the entire room. When we examine an individual’s creditworthiness, for say an automobile loan, in the olden days of lore the credit industry used to examine individual’s debt-to-income ratio to ensure that a typical level of say 33% or less of a person’s income was being spent on debt. Then it became 38%, then 40%, and now what? Well, these ratios are typically calculated using gross incomes, not net. But wait, over the decades local governments grew, state governments grew, the Federal Government became a behemoth. To feed these governments, taxes grew. But taxes have the exact same effect as debt on the economy. That’s because they are a debt!! When your state decides to build a bridge or a school, it will either finance it directly with a tax levy, or it will finance it with bonds that come from the very same central banks that lend money to our Federal Government. They issue bonds from nothing creating new credit money that did not previously exist (no productive effort). The people in the state are thus being indebted by their state, and it is their productive ability that is required to service the state’s debts. Thus the same people who are in debt for their homes, their cars, their credit cards, are also in debt to their city, their county, their state and to their federal government. The total burden of all those debts and obligations now stands well over $300,000 per man woman and child, nearly 750,000 per worker in America and it is growing very rapidly with new burdens such as the latest “healthcare” bill. This bond and debt money system was developed for the benefit of the Central Banks, not the people. They profit from interest and fees for the use of the people’s money system – that is the WHY. Congress did not constitutionally have the power to assign that right away, but it was done regardless and the Judicial system is co-opted by the same money influence removing the check and balance designed into the system. If our nation were to go back to spending non debt-backed money into existence instead, the American public would not be burdened with the carrying costs of all that debt. This is the WHO part of the equation, and why what is more important than WHAT backs your money is who controls it. This saturation would not happen if the United States issued her own sovereign money, created as an asset, not a liability. The Diminishing Productivity Chart is a very useful tool to gauge the level of saturation inside a country. All countries should develop and track this metric. We need good data to make that happen and I would like to point out that I believe the situation is actually much worse in the U.S. than even that chart shows due to the inaccuracies in the way our own GDP is calculated. In fact, if the effects of speculative derivatives and mark-to-fantasy accounting were removed from our financial industry, GDP would plummet back to the reality that it should reflect. There are other very simple metrics that can and should be measured to track debt ratios but they are not. One method is to calculate an overall debt to income ratio for the mean working American. The $52 Trillion Z1 figure (what Chris referred to as MTotal) divided by our working population (140 million) equals $371,000 of total system credit per worker, not counting future liabilities. what does the median worker over the age of 25 earn? $32,000 is all. That leaves the amount of credit per worker to service at 1,160% of income... is all, not counting future liabilites. Can he even keep up with the interest? Of course not, it's ridiculous and that metric should have never been allowed to get so out of control. If you don’t wish to reside, or for your children to reside, in room C or in a debt-backed money box, then please visit SwarmUSA.com, register and participate in the Swarms. It’s completely possible to step outside of the box in which we have been forced to live, and it’s possible to avoid the events which history says may be coming.